The Meadowcreek Parkway Interchange an element of the city's portion of the John Warner Parkway and replaced an at-grade intersection of McIntire Road and Route 250. Construction is expected to be completed in the summer of 2015 though the interchange was opened in January 2015. The city portion of the Meadowcreek Parkway (called McIntire Road Extended) was completed in August 2013, but it will not be open to traffic until the completion of the interchange. The city advertised the project for construction in the fall of 2012 and the lowest bid was submitted by General Excavation of Waynesboro. The city is verifying that bid and will make an award in March 2013, with construction expected to begin in summer 2013. The final design was created the firm RK&K. The Federal Highway Administration issued a "Finding of No Significant Impact" on September 29, 2010, allowing the interchange to proceed to the next phase of construction. After the FONSI was issued, the Coalition to Preserve McIntire Park filed suit against the FHWA to stop the interchange's construction. Judge Norman K. Moon filed a scheduling order on April 25, 2011, and testimony was heard on April 25, 2012. On May 29, 2012, Judge Moon dismissed the Coalition's lawsuit, finding that the preliminary actions taken by the FHWA to estimate the proposed interchange's environmental impact were adequate. Moon also found that the project's impact on the "unique characteristics" (the Rock Hill Landscape and Dogwood Memorial, e.g.) of the surrounding area were not severe enough to warrant halting the project. A cost estimate from January 2012 places the cost estimate for the project at $33.5 million, though the project could increase in cost. The majority of funding comes from an appropriation of two federal earmarks announced in 2005 totaling $27 million via former Senator John Warner (R-VA). Other funds come from the City's match as well as VDOT revenue sharing. This project is being managed by Charlottesville under the First Cities initiative, with technical support provided by VDOT. There is an agreement among the city, county, and VDOT that the interchange must be grade-separated. Some members of the community are alarmed that the north-south pedestrian and bike trails will have to cross the on-ramps leading to U.S. 250 at-grade. The Charlottesville Skateboard Park requires relocation due to the construction of the interchange. February 18, 2003 - City Council hears report from NDS Director Jim Tolbert regarding an RFP that was being issued to study possible intersection designs for where the Meadowcreek Parkway would meet the Route 250 Bypass. July 2007 - Council votes 4-1 in July 2007 to approve project's fit with the city's comprehensive plan. February 19, 2008 - Neighborhood Development staff asks Council to spend $1 million to match a VDOT revenue sharing plan. This would be put aside to pay for pedestrian and improvements, above and beyond the money from the federal government. September 29, 2010: Federal Highway Administration issues Finding of No Significant Impact. 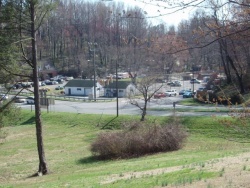 February 22, 2011: Coalition to Preserve McIntire Park sues FHWA to seek injunction against interchange's construction. April 25, 2012: Judge Norman K. Moon hears testimony in segmentation case. May 29, 2012: Judge Moon rules in favor of the FHWA. The project's initial development was overseen by a steering committee, appointed by the Charlottesville Mayor and City Council. ↑ Web. Regional planning officials discuss projects, future changes, Tim Shea, Charlottesville Tomorrow, April 22, 2013, retrieved April 24, 2013. ↑ Web. As interchange work progresses, city’s portion of Meadow Creek Parkway is completed, Daily Progress, World Media Enterprises, 4 Aug 2013, retrieved 5 Aug 2013. ↑ Web. Construction nears for parkway interchange, Sean Tubbs, Charlottesville Tomorrow, January 15, 2013, retrieved January 24, 2013. ↑ 5.0 5.1 Web. Parkway interchange awaits result of federal lawsuit, Sean Tubbs, Charlottesville Tomorrow, February 26, 2012, retrieved October 6, 2014. ↑ 6.0 6.1 Web. Route 250 Bypass Interchange at McIntire Road Press Release, Charlottesville, Virginia, retrieved October 1, 2010. ↑ 7.0 7.1 Web. Meadowcreek opponents file federal suit, Sean Tubbs, February 24, 2011, retrieved October 6, 2014. ↑ Web. Route 250 Bypass Interchange at McIntire Road hearing soon to be scheduled, Peter Kleeman, May 9, 2011, retrieved May 10, 2011. ↑ 9.0 9.1 Web. Judge Moon rules against Coalition to Preserve McIntire Park; Parkway Interchange to proceed, Sean Tubbs, Charlottesville Tomorrow, May 29, 2012, retrieved October 6, 2014. ↑ Web. Earmark - Construct Meadowcreek Parkway Interchange, Charlottesville ($2 million), Office of Management and Budget, retrieved 4 Jan 2012. ↑ Web. Earmark - Construct Meadowcreek Parkway Interchange, Charlottesville ($25 million), Office of Management and Budget, retrieved 4 Jan 2012. ↑ Web. Charlottesville City Council meeting minutes, .pdf, Council Chambers, City of Charlottesville, 18 Feb. 2003. ↑ Web. 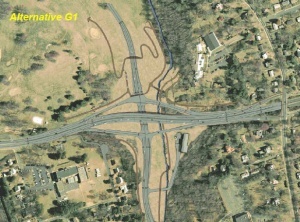 Council acts on Meadowcreek Parkway Interchange, Charlottesville Tomorrow, 3 July 2007, retrieved 9 July 2013. ↑ Web. Oval roundabout preferred by 250 Interchange Steering Committee, Sean Tubbs, Charlottesville Tomorrow, March 20, 2008, retrieved October 6, 2014. ↑ Web. 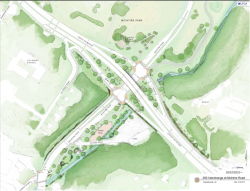 City Council selects signalized intersection for Meadowcreek Parkway interchange, Sean Tubbs, Charlottesville Tomorrow, June 5, 2008, retrieved October 6, 2014. ↑ Web. Judge Moon hears testimony in Meadowcreek interchange case, Sean Tubbs, Charlottesville Tomorrow, April 25, 2012, retrieved October 6, 2014. This page was last edited on 25 March 2015, at 14:49.